I spent an embarrassing amount of time searching for the right skirt pattern for my black & white floral cotton pique I picked up at Metro Textiles. I knew it should be a full skirt, and I have a couple that I've made, but nothing seemed quite right. And then I saw Allison's version...which I'd seen Dorca's version first but didn't register the pattern. I think I thought the skirt was RTW and the wrap top was handmade. Dorca has made it twice - both fabulous! 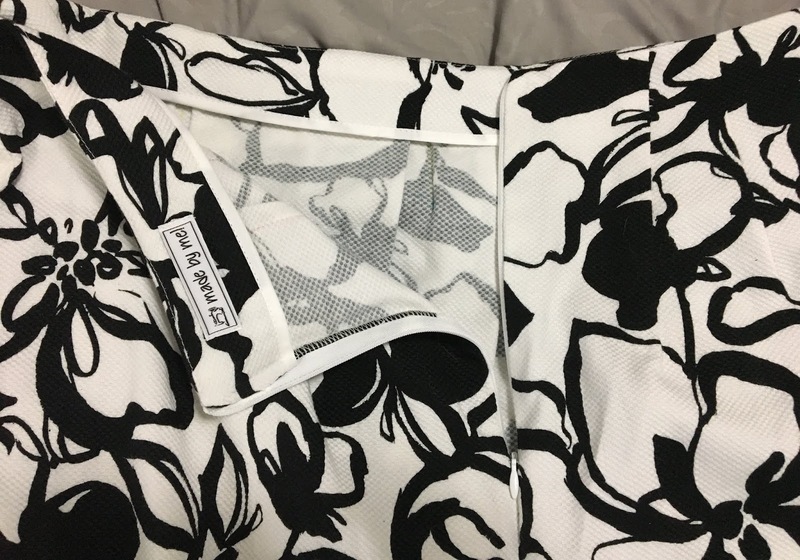 At any rate, I knew it would be the perfect pattern for my fabric!! 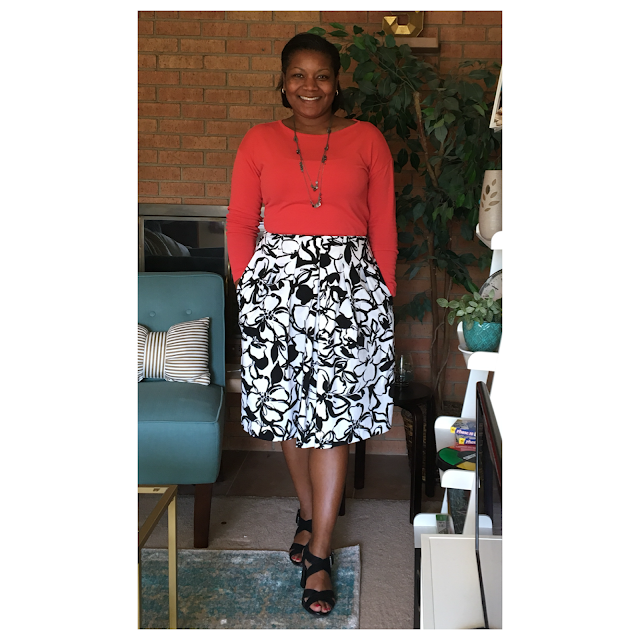 I used my normal Burda sizing for skirts - 42 front and 44 back. I did not add any hem allowances as usual and hemmed at 2 inches. 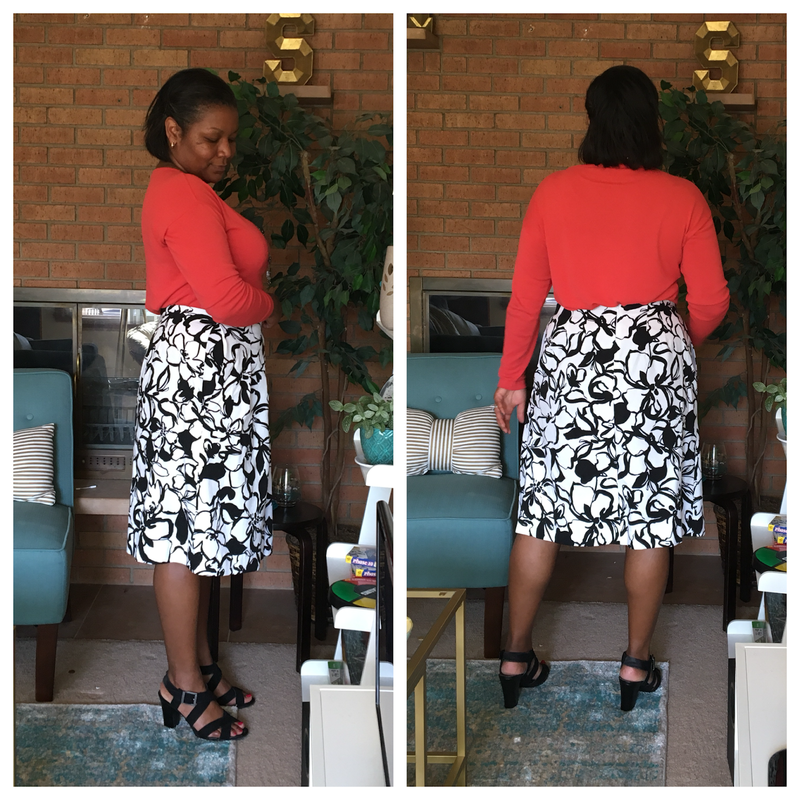 I love the look of midi skirts but rarely like them on my body. I'm more of an 'any length from mini to *just* below the knee' kinda lady. I used a 9" invisible zipper and made a facing instead of lining it. Once the pleats and darts were sewn, I traced the waistline onto tracing paper and then marked 2 1/4" from that line. I could have made the facing a little deeper. I finished it with bias tape because why not?! I sewed the facing to the zipper tape by hand and was going to hem by hand but I wasn't sure if I liked it or not and went for the faster (read: FINISHED ALREADY!) route of blind hemming by machine. I was going to try to "fix" my hem - you can see it dipping forward on the photo above and mine does the same. I decided potentially ruining the hemline wasn't worth it. I also had a bit of a tough time figuring out where on the body the waist is supposed to sit. I guess it's a high-waist skirt?? I think that contributed to me being uncertain about it - that and trying it on with 'night belly'. When I came back a day or two later and tried it on with several tops in the wardrobe, I liked it a lot more. This skirt is a quick and simple sew. I did get a little messed up with the pockets though. They extend up to the waistline which makes them a bit of a pain to sew IMO! Also, I thought my pockets were gaping but looking at the line drawing now, I guess they're functioning as intended. 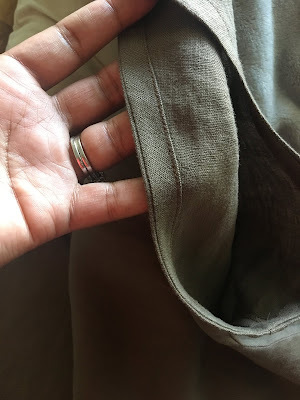 The only problem is, this pique is pretty 'sticky' and the pockets shift around even though they're caught in the facing/skirt seam. It looks like I should have stitched down further from the waist. 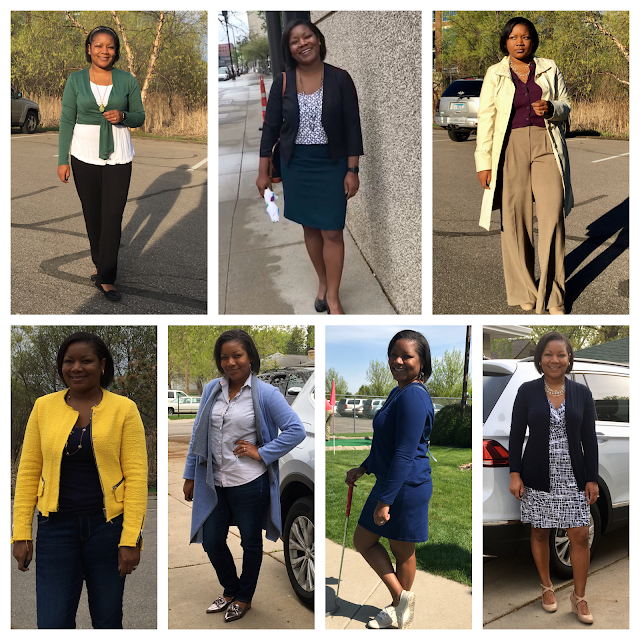 Re: Me Made May...here is what I wore days 8-14. There was a post on the Sewcialists blog that got me thinking. Every year there's a ton of people who are completely annoyed by MMM and a bunch of people that sort of hem and haw over the "requirements". But there aren't any requirements. I mean, right?! Below is my comment on the blog post. Someone else commented and mentioning getting to where I am. That made me remember that I am pretty good about being completely unbothered by what anyone else is doing that doesn't affect me. And that confidence/self-assurance/independence can look a different way to people who are unlike me. I will never not be me, be clear! LOL! I'm just offering some background. I’m glad you are doing what works for you…but also recognize that the pressure you felt was self-imposed. I mean, lots of people do it. I hear this a lot my 5th year in re: MMM…Not having “enough” handmades to participate (if you have two handmade things then your pledge can include those 2 handmade things!! ), etc. And the nature of social media itself makes it worse IMO. So I think it’s totally a personality thing. I don’t choose my outfits because I’ll be sharing them…I wear what I wear because that’s what I want to wear! LOL!!! I have totally worn a garment on subsequent days…I don’t aim for ‘beautiful, staged’ photographs…I don’t sew new things “for” MMM, I don’t worry about wearing what’s “popular” or “trending”…I have to get dressed everyday (well, almost everyday) and then I take a pic and post it. The best part for me is that I always have some sort of revelation about a garment or outfit combination. This year, as my pledge included wearing “full handmade outfits” twice per week, I’ve learned that that isn’t actually important to me. I realized how EXCITING it is that my handmades and my RTW purchases really meld together. I am very often mixing the two and really, that’s a GOOD thing for me! It means I’m making and buying things that actually work for me, for my body, for my lifestyle. 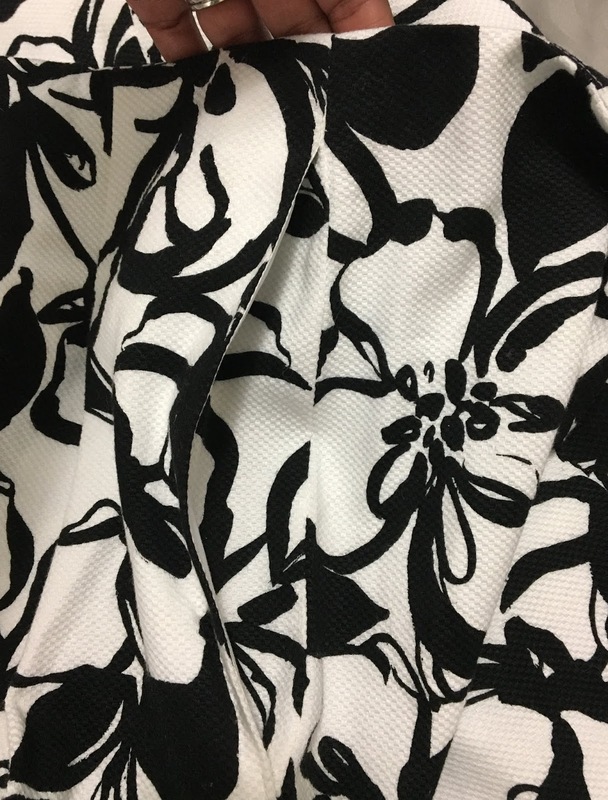 I also love that I find new-to-me patterns or patterns styled in way that makes me take notice, when I’d previously overlooked it. Most importantly…there’s room for all of us no matter how we “use” sewing in our lives!! I hope that anyone who wants to participate does so, without feeling pressured by what others are doing. Be it fully handmade outfits, wearing all the "of the moment" patterns, taking magazine quality pics, whatever you think you need/have/are required to do to participate in Me Made May...just know that there really is no sewing community police. Do you! Exactly the right pattern for that skirt. As for MMM I agree with you wholeheartedly. In fact, I have sort of got bored with it, because to me it seems to be a place where people don't adhere to the spirit of the thing, but wear a different outfit everyday. I am such a capsule dresser and frequently wear striped t shirts or a knit top and the same pants for a few days - not the tops, they need washing, but I often wear very similar tops. I seem to have a few other problems to solve in life at the moment, so have also decided MMM is lower down my list (much lower) of priorities. Yes, it's super important to know or learn what works for you individually. MOST of us have wardrobe workhorses...things that are just staples and we wear them again and again. And that's okay! People shouldn't feel pressured to present something new and different or super photogenic each day. I really like the shape of that skirt. Looks like it wants a fabric with at least a bit of body. Once I find something appropriate I’m giving this one a try. Thanks!! Yes, *some* body I think works well. Before I traced it off I considered using the Vogue 1501 pattern that I made two skirts from. But I think that skirt requires something with drape. This one works perfectly for something a bit heavier!! I agree completely on the thoughts on MMM. And I love the print of the skirt. Looks fabulous on you. Fantastic skirt, I feel that the kind of fabric you, me and Dorcas all used suit the pattern really well. I too messed up the pockets I think! Thank you! YES! Fabric with a little bit of body but not too much. I'm so glad I saw you all's versions because that unhelpful photo in the mag did NOT sell it. The skirt is beautiful. Love the print with that pattern. Also enjoyed your comments about MMM. They're so on the mark. I don't do MMM. I have the outfits, like you, a combination of RTW and MM. I don't do it because it's a lot of work -- I just don't have time take pics everyday. I love how you do a weekly capsule of yours. Your clothes do meld seamlessly into a working outfit. Your skirt looks amazing! Lovely fabric choice. Your me made made outfits are all gorgeous! Thank you so much! !I was afraid it might be a wadder midway but so glad it worked out! ...and the NYC fabric parade begins! *LOL* I knew this would make a wonderful skirt when you picked it out...glad we were both right. As for MMM, I'm one of those that can do without it and wouldn't miss it if it was gone...but I'm never gonna tell another sewist what to do so go for it and do you...cause I'm definitely over here in my corner of the world doing me! This is actually the 4th piece of fabric I've sewn from the haul! But I do have 2 more "Kashi" projects planned haha! The green Ogden and pants in that light grey shimmery suiting. And from Mood that tweed suiting with the splatter using my TNT skirt and I want to use the striped denim soon but don't actually have a project in mind yet! Your skirt looks wonderful! I always love seeing how beautifully you finish the inside too. I have enjoyed following along on your IG and seeing all your handmades for MMMay. You have definitely found a good balance between me made and RTW. I also agree with your sentiments about MMMay. Make it your own! This is my first year participating, and it is challenging enough to keep me motivated and engaged each day, lol! You always look so chic! I bought the NL6481 pattern because I saw your jacket, I need to make it! Love the skirt pattern, and just perfect with that pretty fabric. Looks so pretty on you. Happy sewing. You've had a marvelous MMM! Your comments are appreciated! I will always respond to questions and try to respond to each and every comment! Sewing Addict. That about sums it up!! I love to sew and I love collecting fabric and patterns. Find me in the community as KS_Sews!